See my point? No fun at all. 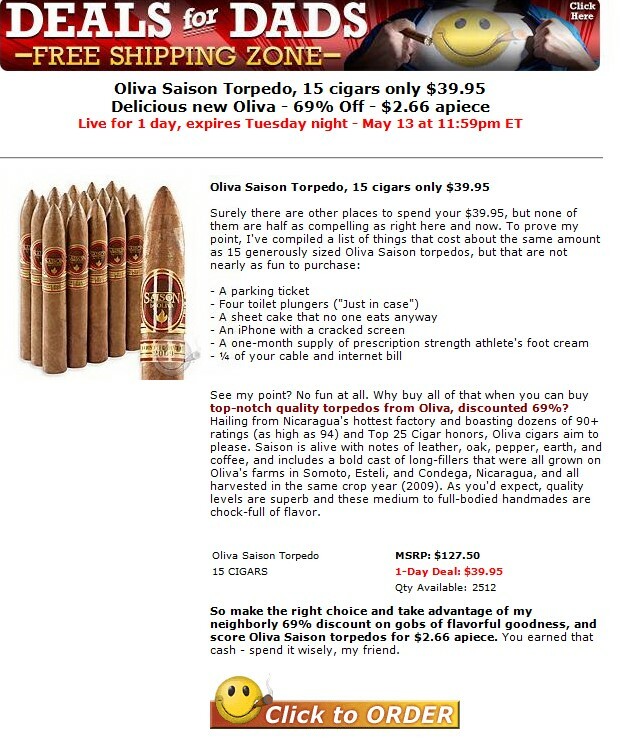 Why buy all of that when you can buy top-notch quality torpedos from Oliva, discounted 69%? Hailing from Nicaragua’s hottest factory and boasting dozens of 90+ ratings (as high as 94) and Top 25 Cigar honors, Oliva cigars aim to please. Saison is alive with notes of leather, oak, pepper, earth, and coffee, and includes a bold cast of long-fillers that were all grown on Oliva‘s farms in Somoto, Esteli, and Condega, Nicaragua, and all harvested in the same crop year (2009). As you’d expect, quality levels are superb and these medium to full-bodied handmades are chock-full of flavor. So make the right choice and take advantage of my neighborly 69% discount on gobs of flavorful goodness, and score OlivaSaison torpedos for $2.66 apiece. You earned that cash – spend it wisely, my friend.